Another instalment of our popular “Miscellany” series this time focusing on steam in Wales. It features mostly previously unseen footage largely compiled in the order the film runs off the original cine reels. We begin at Llangollen and travel on to other locations along this route including Berwyn (with Dukedog 4-4-0s and even a Bulldog 4-4-0), Glyndyfrdwy, Llandderfel, Bala Junction, Bala and the loop at Garnneddwen. The line from Pontypool Road to Neath cut across the heads of the valleys of South Wales and was inevitably a steeply graded route with many tunnels and viaducts. The most famous of all these viaducts was the Crumlin Viaduct, the highest in the country. There is plenty of film footage here for us to admire this massive structure. Hengoed Viaduct is also seen along with both the High Level and Low Level stations. We then visit Nelson & Llancaiach, the branch to Cwmbargoed and Dowlais Cae Harris and Quakers Yard High Level before visiting Aberdare High Level with its staggered platforms. Into North Wales, we visit Bangor and then on Anglesey, Llanfair PG, Gaerwen and Amlwch. Moving south again, we visit the Central Wales line for the decent from Sugar Loaf Summit and Llandovery. The line from Shrewsbury to Chester forms the eastern boundary of this volume and we include footage at Chirk, Cefn Viaduct, Ruabon, Croes Newydd and Gresford Bank and in the snow, the Brymbo Branch. On the Cambrian main line we visit Welshpool, Talerddig Bank, Macynlleth, Dovey Junction, Borth and Aberystwyth; this coastal route includes visits to Gogarth Halt, Towyn, Fairbourne and Barmouth. Back to South Wales and we see steam action at Cardiff, Newport (including a visit to Cashmore’s scrapyard), Severn Tunnel Junction and Torpantau. We then journey down the Rhondda Fach from Maerdy and see freight trains labouring up the Llanvihangel Bank complete with banking assistance. All in all a veritable feast of Welsh Steam! Motive power includes: ex-GWR 94xx, 74xx, 16xx, 57xx, 56xx, 41xx, 61xx, 42xx,72xx, 56xx, 2251, 43xx, 28xx, Dukedog, Bulldog, Castle, Hall, Grange and Manor classes, ex-LMS Ivatt 2-6-2T & 2-6-0s, Black 5s, 4F 0-6-0s, 8Fs and Coronation Pacifics classes plus BR Standard Britannias, Class 5 and Class 4 4-6-0s, Class 4 2-6-4T and Class 3 2-6-2 tank engines. The archive film is in both colour and Black & White. An authentic sound track has been added along with a commentary to complement this nostalgic look at the last years of Welsh steam. Cover photo: Keith Pirt/Courtesy of Book Law Publications, 7828 “Odney Manor” at Welshpool Station, July 1963. This is the first volume in our popular “Miscellany” series to cover Southern steam. It features previously unseen footage from the Jim Clemens Collection and is mostly compiled in the order the film runs off the original cine reels. In this volume we feature a wealth of Southern steam with particular emphasis on the Withered Arm, Basingstoke and Somerset & Dorset areas as well as between Weymouth and Lymington Pier. In the 1960s, Jim Clemens purchased a significant quantity of original 16mm offcuts and unused film directly from Pat Whitehouse. These were from the BBC “Railway Roundabout” TV programmes. 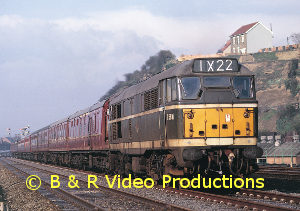 Some of this footage has been used in this volume and includes a journey from Bath Green Park to Evercreech Junction with 7F 2-8-0 53807 plus T9 4-4-0s working on the Withered Arm lines. Places visited also include Barnstaple Junction to Torrington and Halwill Junction, Bude, Basingstoke (especially in 1962 and 1967), Exeter, Micheldever, Eastleigh, Wilton, Gillingham, Templecombe, Corfe Castle, Worgret Junction, Bulford, Bentley, Wadebridge, Otterham, Yeovil Town, Yeovil Junction, Hampton Court, Weymouth, Weymouth Shed, Upwey & Broadwey, Upwey Wishing Well Halt, Dorchester South, Bournemouth, Brockenhurst, the Lymington Branch, Bath Green Park Shed, Devonshire Tunnel, Midsomer Norton, Shepton Mallet, Evercreech Junction, Tavistock North, Okehampton, Seaton Junction and Evershot Bank. Quite a variety! During our travels, we see a complete cross-section of 1960s Southern motive power including locomotives from classes M7, Beattie Tank, Q, Q1, 700, T9, S15, W, N, Lord Nelson, King Arthur, Schools and West Country and Merchant Navy pacifics. BR Standards also put in an appearance with examples from Class 5s, Class 4 4-6-0s, Class 4 2-6-0s, Class 4 2-6-4Ts, Class 3 2-6-2Ts and even a 9F 2-10-0. Plus not forgetting a sprinkling of LMS Class 2 2-6-2Ts and a solitary Black 5! The archive film is in both colour and Black & White and was mostly dates from 1960 to 1967. An authentic sound track has been added along with a commentary to complement this nostalgic look at the last years of Southern steam. Cover Photo:- Alan Maund, 34086 “219 Squadron” at Crediton on 18th.August 1962. This is the first volume in a series featuring the diesel electric locomotives of British Rail. Here we mostly cover the low powered Types 1 & 2 . Many scenes are from the early days with locomotives in their original green liveries ; others show the changes into BR Corporate Blue. We start with glimpses of English Electric Type 4s, Deltics (including some rare footage of the blue prototype on action of the ECML), and a Metrovick Co-Bo! We also see Southern DEMUs including those specially designed for the narrow tunnels on the Hastings Line. A brief visit to Crewe Works is followed by footage of the very successful EE Type 1s in action at Bescot, Loggerheads, on the WCML and at several collieries. 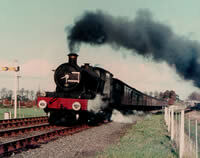 The less successful centre-cab Clayton Type 1s are seen in action at Shotts, Millerhill, Pelaw and on Hest Bank. The workhorse Brush Type 2s were introduced in 1957 and there are scenes of them at work at many locations across the network including Harringay, Hadley Wood, Cambridge (on the Royal Train), Paddington, Wennington, Instow on the Bideford branch and on the last train along the Dunstable branch (“The Skimpot Flyer”). In Scotland, the short lived North British Type 2s are seen at Elgin, Perth, Inverurie, Gleneagles and Stirling. The numerous BR Sulzer Type 2s operated throughout the UK. We see them as far afield as on Tyne Dock Iron Ore trains, the Tay Bridge, Kyle of Lochalsh, Thurso, Ais Gill, Manchester, North Wales and Dawlish. We also see them on the Cambrian at Llynclyss, on milk Trains at Torrington, china clay trains around Bodmin, and at Bredbury Junction being banked by a Stanier 8F. Even a pair triple heading with a BRCW Type 2 on the “Royal Highlander”! All the archive film is in colour and an authentic soundtrack has been added along with an extensively researched commentary. In this fourth part of our series, we mainly cover the railways in South Wales and mostly in the days of steam between 1960 and 1965. We feature many of the 0-6-2T and 8-coupled types famous for their use in this part of Wales. After a few brief scenes in 1960 at Towyn on the Cambrian, we visit the South Wales main line at Pilning for views of double-headed coal trains. Then to Cardiff for 0-6-2Ts, 2-8-0s, Prairies & Pannier tanks and even an 8F interloper from Toton! There is extensive footage of a 1964 SLS “Farewell to Brecon” tour, first with 0-6-2T 6606 via Abercynon and Quakers Yard to Merthyr, then onwards to Pontsticill and Brecon with pannier 3690 plus newly preserved 2-6-2T 4555. We return via Dowlais. A brief fast-forward to 1977 and the last Western diesel hydraulics on railtours to Treherbert, Aberdare, Merthyr & Pontypridd. We return to Cardiff for more 2-8-0Ts, Castles and 9Fs before travelling along the South Wales main line to Ebbw Jct. There are busy scenes at Newport and on the main line before reaching Severn Tunnel Junction. Further along we pass the Severn Road Bridge under construction and arrive at Gloucester, for scenes there in 1962 & 1964. The Vale of Neath line ran from Pontypool Road. We see a lot of activity around Pontypool and visit Hafodyrynys mine for its Hunslet 0-6-0STs. Crossing the 200ft high Crumlin Viaduct, there are spectacular views of the valley below. The demolition of the viaduct is witnessed in 1967. Then to Hengoed, Treharris, Quaker’s Yard and Mountain Ash Colliery (for its saddle tanks), before arriving at Neath. We visit Duffryn Yard depot on our way to Swansea, where in 1965 we join the last steam hauled special to Fishguard and Milford Haven with 6859 “Yiewsley Grange”. 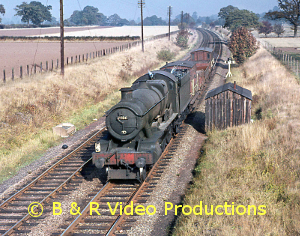 Plus some footage of the Tenby branch in 1960 with Prairies and Panniers. We conclude Part 4 with B&W and colour scenes at Cardiff Canton shed just before closure. All the archive film used is mainly in colour and an extensively researched commentary along with an authentic soundtrack has been added. 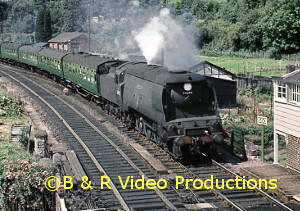 In this second part, we begin at Gobowen on the Shrewsbury to Chester main line before looking at the connection to Oswestry and the Cambrian line south to Llanymynech and Llanfyllin, prior to its closure in 1965. We return to Gobowen with a stone train and then onwards to Shrewsbury. Steam finished here in 1967 and there is a rare appearance of the Blue Pullman amongst the Black 5s. Onwards, we travel west along the Cambrian route to Machynlleth and Aberystwyth, using ex-GWR Manors and the later BR Standards for motive power. Along the way we see steam scenes at the narrow gauge Welshpool & Llanfair Railway both before and after preservation. The Vale of Rheidol is also visited when its original Aberystwyth terminus was in use. Finally, with steam reigning supreme, we return to Shrewsbury via Talerddig Incline with some contrasting views of steam returning to the route in later years. Included are some black & white film scenes of the estwhile Corris Railway. Manors, Halls, Black 5s, Ivatts and BR Standards are all featured, even a Dukedog! The archive film material used is in colour, except for the Corris Railway scenes, with an authentic soundtrack and an informative commentary. Cover Photo:- Dr. Gaius Sutton, 75012 climbs Talerddig, 20/8/66. A video covering the last section of the route of the CAMBRIAN COAST EXPRESS from ABERYSTWYTH to PWLLHELI and what could be seen in the area from the 1950s to the 1980s. We cover four narrow gauge railways, the Vale of Rheidol, the Talyllyn, the Welsh Highland (1964) and the Ffestiniog, and two miniature railways, the Fairbourne and Butlins, Pwllheli. We even cover the Aberystwyth Cliff Railway! The coast route would see steam and diesel motive power but this film is mainly steam with Standard Classes 4MT, Class 2MT, Class 3 2-6-2Ts and Class 4 2-6-4Ts, GWR 43xx 2-6-0s and Manor Class 4-6-0s, Ivatt 2MTs and even Class 4. The picture is completed by the reopening of Barmouth Bridge in 1986 and Electric Electric Class 37s. There is much truly archive material used in this production recapturing a bygone era of this popular Cardigan Bay coastal area. The lines still survive today so compare the scenes of that era shown here with modern day or witness the efforts made by the preservations to recreate it. There is an extensively researched commentary with an authentic sound track. Cover photo: Keith Pirt, 7810 “Draycott Manor” on Llanbadarn Bank, 1963. This third volume in the series covering the Cambrian Coast Express Route from London to Aberystwyth and Pwhelli, takes a look at the line west of SHREWSBURY through the hills of Mid-Wales over TALERDDIG summit. Using archive steam material from the 1960s with occasional diesel footage such as the first ever visit of an HST working in 1983, WELSHPOOL is reached. Here there is extensive coverage of the Welshpool and Llanfair line in its pre-1956 working days with freight. Onwards over TALERDDIG with Manors and Standards and a few views of the return to steam tours. MACHYNLLETH is seen also in great detail and variety with film sometimes from the 1950s; ex-Western motive power including Dukedogs and eventually their Standard class replacements up to 1967. The Aberystwyth line through GLYNDFI and BORTH is followed by some scenes on the Vale of Rheidol when it had its own terminus station. Filmed in colour except for the earliest material, this video takes a fascinating and nostalgic look back at the steam scene of the 1960s. The film has an authentic sound-track and has been researched in detail to give an informative commentary. Cover photo:- Keith Pirt. 7828 “Odney Manor” meets 7810 “Draycott Manor” at Newtown in July 1963. This second video about the CAMBRIAN COAST EXPRESS takes a look at the section from SHREWSBURY to WELSHPOOL. Shrewsbury is covered in great detail at the station and motive power depot. Engines from both the Midland and Western Regions are seen including Castle, County, Hall and Manor classes, Duchess, Jubilee, Black 5 and 8F off the Midland. There are Ivatts and Standards especially in 1966. The diesel scene has come rarities. Besides the Class 37 there is a Peak on the Hookagate line, the Fisons weed-killing train, 08′s on the oil workings to Abbey Foregate and the short lived visits of the Cromptons. Preserved King 6000 “King George V” works the Centenary dining car set in 1979 and 5596 visits Hookagate yard. A visit to the Severn Valley line when it was still connected to Shrewsbury from Bridgnorth. The MINSTERLEY branch with steam and the long single line route to Welshpool with Standard 4′s and Manors. Coverage of some of the Tal-y-Llyn specials also with Dukedogs. A very definitive programme of this section of the route. Filmed mostly in colour this video has an authentic sound-track and informative commentary. Jim Clemens Collection No.16. There were four railway routes to the town of BRECON in Mid-Wales until 1967. There was a line over the Brecon Beacons to NEWPORT via TORPANTAU climbing to over 1300 feet. From the west came the 33 mile railway along the VALE OF NEATH. Connecting Brecon into the Midlands there was a line to HEREFORD via HAY-ON-WYE. Then to the north the Mid-Wales Railway followed a scenic route via BUILTH WELLS into the Cambrian mountains to reach LLANIDLOES and MOAT LANE. All these routes are covered in detail from the camera of JIM CLEMENS up to the closure of the lines in 1962.Motive power over the routes was in the hands of GWR 5700 Panniers and LMS Ivatt Class 2 moguls. All filming was done between 1960 and 1962 including the last weeks at Brecon when the 1962/3 winter began with heavy snowfall. There is also coverage of the last steam into Brecon in 1964 from Cardiff with an enthusiasts special. A second volume of our land cruise around the Cambrian Mountains. This journey continues from SHREWSBURY to BARMOUTH via RUABON, LLANGOLLEN and DOLGELLAU. Extensive coverage of SHREWSBURY is seen in the early 1960’s at the station and a detailed look at steam locomotives on Coleham sheds. Here LMS and GWR engines were serviced from Panniers to Black 5s, Manors and Granges. The station saw Jubilees and through and transfer freights behind 28xx, Manors, and Halls. Journey north via LEATON BASCHURCH and GOBOWEN with diversions to WHITCHURCH and OSWESTRY. A visit to IFTON colliery and CHIRK to RUABON. Sun and snow at LLANGOLLEN LINE JUNCTION. Continue down the Dee Valley via LLANGOLLEN. Here we see how it used to be in the 1960’s and comparative views of the preserved line from LLANGOLLEN to CARROG using 1980’s and 1990’s views of visiting engines to this railway. Some home based engines as well! On to BALA and DOLGELLAU in 1964. Finally MORFA MAWDDACH and BARMOUTH, even track recovery trains on the Dee valley route that closed in 1965. Motive power seen includes Manors, Granges, Halls, 28xx, 2251, Panniers and 43xx. LMS Black 5s, Jubilee, 8Fs and 2MT, backed up by a few Standard Classes. The scenery on this route is again superb forming a great backdrop for the steam action on these main and secondary lines. Some views date from 1959, one from 1930, in this comprehensive account of the line from SHREWSBURY to BARMOUTH via the Dee Valley. A nostalgic look at the railway between BARMOUTH and SHREWSBURY via DOVEY JUNCTION in the 1960’s. Virtually every station and halt along the route are seen and the scenic grandeur of this route is followed along the Cambrian Coast with steam trains attacking the climbs of FRIOG and TALERDDIG.The Talerddig climb is particularly impressive with Manors, Standards and Ivatt Moguls doing battle with the 1-in-52 gradient in all conditions of weather from sunshine to snow. A Standard stalls and gives an impressive display re-starting and damaging the track.The delightful Severn Valley from MOAT LANE through NEWTOWN and WELSHPOOL to SHREWSBURY where semaphore signalling abounds. Motive power seen is Manors, both clean and filthy, Standard tender and tank classes and Ivatt Class 2 Moguls. Brief visits are made to the FAIRBOURNE, TAL-Y-LLYN and WELSHPOOL and LLANFAIR RAILWAYS in the 1960’s. The CAMBRIAN COAST EXPRESS followed a route from Paddington to Birmingham, Shrewsbury and Talerddig to Aberystwyth and Pwhelli. In this first volume of the series, we trace the route from Paddington to Shrewsbury. Using archive footage, the route is seen with steam haulage over a period from 1960 to the 1970’s with some early diesel film of the Hydraulics and Blue Pullman as well. There is mainly ex-GWR motive power from Kings, Castles. Halls and Praire tanks. See steam powering up Hatton bank in 1962 with Kings and Castles and on through the Birmingham suburbs to Tyseley and into the old Snow Hill Station. We visit both the old and new Snow Hill stations. A diversion to the Old Hill and Dudley branches and then on to Wolverhampton, Wellington and Shrewsbury. Jim Clemens Collection No.10. (Including the Central Wales Line). A video of the steam age of railways in Mid and West Wales, north of SWANSEA with full coverage of the Central Wales line from SWANSEA to CRAVEN ARMS in both directions. The CARMARTHEN to ABERYSTWYTH line closed in February 1965 and this is a detailed look at the line in the days when Manors worked the services. Two branches ran from this route to NEWCASTLE EMLYN and ABERAYRON. These are seen in great detail worked by pannier tanks on pick-up and milk traffic. ABERYSTWYTH to WELSHPOOL and LLANYMYNECH was the Cambrian Railways route through Mid Wales and a return journey from the train and the line side is undertaken, all in Wales. Standard, Manors, panniers and LMS power, including a Jubilee over the Central Wales line, all feature in this production covering a beautiful part of Wales seen through the camera of photographer JIM CLEMENS. A superb film of the steam age from Shrewsbury to Aberystwyth. 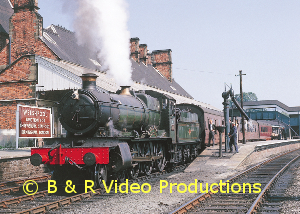 From local enthusiast cameraman and Radio commentator Russell Mulford’s collection of railway films, we offer an in depth look at the steam scene of Shrewsbury. Many types of locomotive are seen at the station and shed. Castle, King, Grange, Manor, 28xx, pannier, Jubilee, Black 5 and Standard designs are a few. Servicing on the shed when the turntable stuck! A comprehensive journey through Westbury, Welshpool, Talerdigg, Machynlleth to Aberystwyth. Token exchanges vividly portrayed, an action packed railway so loved by enthusiasts to its last steam train in 1967.